Goalz unlimetd in association with other sponsors brings in one of the most epic football events of 2016. 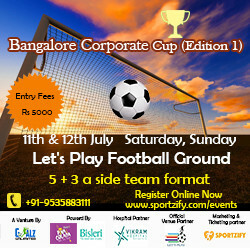 A complete 5 a side football tournament only for the corporates. Be a part of this event to expeirience the real football fun and entertainment. - 7 min each half with one min of break. - The trophies are unique made by a group NGO women in North Karnataka.